The movement is gaining steam! Check out the media coverage that this project has attracted so far. NOTE: Although some of the earlier reports mention tax-deductible contributions for the project, unfortunately tax-deductibility cannot be offered at this time. Also, references to hatchfund.org are no longer valid. On March 12, 2019, the Tallahassee Democrat in Tallahassee, FL, published an interview of Marty Klein by Paula Mitchell on the front page of the newspaper's "TLH Life" section. 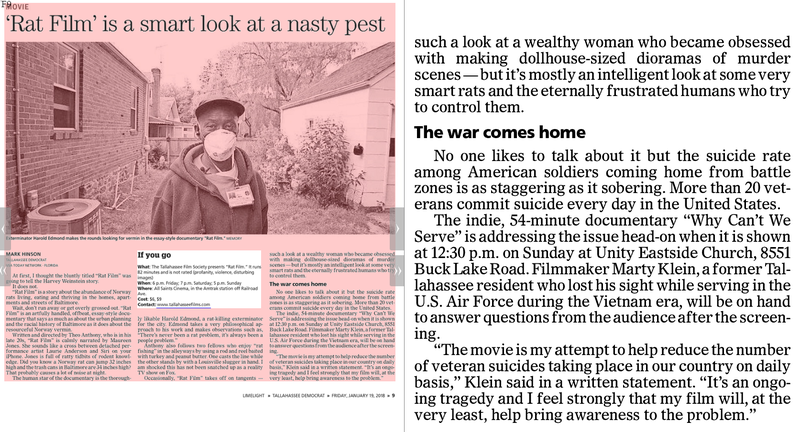 The article was in support of showings of the film in the Tallahassee area. To see full-page views of how the article appeared in the print edition, view these files: Page 1B and Page 2B. To read the entire article, go to this online version or this accessible text file. On March 1, 2019, Marty Klein was interviewed by Tom Flanigan, program director for news at WFSU-FM, Tallahassee, FL. The segment aired twice on the morning of March 5. To listen to the report, which is just over 4 minutes long, click on the play "arrow" in the media player below. ​Or you can listen via this page on the station's website, which includes accessible text. A feature article on the documentary and it's theme song, "A Veteran's Anthem," was published in December 2018 on the U.S. Veterans Magazine website. Read the article. A report about the documentary project and a special screening event was broadcast on November 13, 2018, on WAMC-FM, an affiliate station of National Public Radio. Visit this page to read or hear the report. Marty Klein's keynote address at the Veterans' Day ceremony in Kingston, NY, was covered my MidHudsonNews.com. Read the report that was published on November 12, 2018. Marty Klein's Veterans' Day address in Kingson, NY, was covered by a TV crew from Spectrum News, Hudson Valley. See the video or read the report on this page. On November 11, 2018, NewYorkUpstate.com published a report about the documentary project and Mary Klein's campaign to have the movie's theme song, "A Veteran's Anthem," played on radio stations on Veterans' Day. Read the report. Marty Klein was interviewed on WDST-FM in Woodstock, NY, on November 10, 2018. Listen to a recording of the broadcast on this Facebook page. Marty Klein was interviewed on WBAI-FM, New York, NY, on November 7, 2018. Listen to a recording of the highlights on this Facebook page. On October 31, 2018, the Hudson Valley Post published an interview of Marty Klein, pertaining to the documentary project, a special showing taking place in November, and Marty's campaign to have the film's theme song, "A Veteran's Anthem," played on radio stations on Veterans' Day. Read the article on the Post's website. In October 2018, Hudson Valley Heroes produced a five-minute video report about the documentary project and "A Veteran's Anthem," the film's theme song. View it on the Hudson Valley Heroes Facebook page. The weekly entertainment section of the Tallahassee Democrat mentioned the first public showing of Why Can't We Serve in the Movie column by Mark Hinson on January 19, 2018. Read the item in this graphic file or this text file. 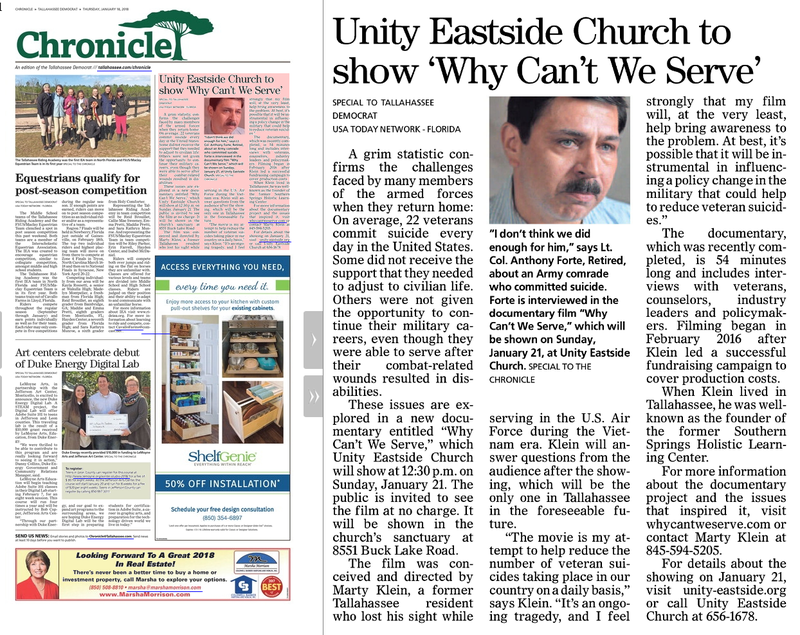 This newspaper in Tallahassee, FL, published an article in its Chronicle section on January 18, 2018, announcing the first public showing of Why Can't We Serve. Read the article in this graphic file or this text file. Marty Klein was interviewed by Candace Dunkley for a TV report on Spectrum News. The segment was first broadcast on April 13, 2017. To view the video, visit this page and click on the large play arrow. Marty was interviewed for an article posted on August 5, 2016, in Omega In Action, an online newsletter published by the Omega Institute. It's a good summary of the documentary project. To read it, visit this page and scroll down to the article with the headline "Documentary Says Disabled Veterans Can Still Serve." Marty was interviewed by Brian Hubert of the Daily Freeman, Woodstock, NY, for an article that was published on July 31, 2016. It's an excellent overview of the documentary project, the reasons behind it, and Marty's personal history. Read the article. Marty was interviewed on Michael Neeley's ﻿Consciously Speaking﻿ podcast, posted December 30, 2015. Listen to the podcast. Marty was interviewed by Charlie Holmes for an article published on Veterans Day, November 11, 2015, in The Daily Mail, Catskill, NY. Read the article. A blog written by Marty was published on November 6, 2015, by VisionAware.org. Read the article. Marty was interviewed by Mel Scott for Episode 29 of the "Eyes-Free Fitness" podcast series produced by Blind Alive. The podcast was posted on November 5, 2015. To listen to Marty's segment, which is about 29 minutes long, follow this link and click on the play button. Also, below the player, a link is provided for downloading the podcast. A column written by Marty was published on November 4, 2015, in the Center for the Visually Impaired's "SIGHTSEEING" blog. Read the article. Marty was interviewed by Rama Jon for the October 31, 2015, edition of the Rama on Writing webinar series. Watch a video of the webinar. Marty was interviewed by Violet Snow for an article in the Woodstock Times, Woodstock, NY. The article entitled "Military careers for the disabled?" was published on October 5, 2015. Read the article. Marty was interviewed by Doug Grunther and Susan Rosen of WDST-FM, Woodstock, NY, in a broadcast of "Woodstock Roundtable" that aired on August 30, 2015. To listen to Marty's segment, which is about 21 minutes long, click on the play "arrow" in the media player below. Or, if you prefer, you can read a transcript of the interview in this text file. Marty's vision for servicemen and women with disabilities in the military first came to light in this article published in Dialogue Magazine in 2013. Read the article.